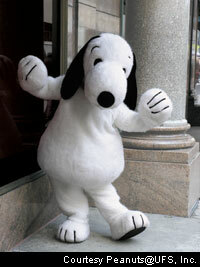 Police have arrested a man who was trying to break into prison to spring an inmate while dressed as Snoopy. Jail workers were stunned when confronted by the Peanuts character waving a gun, reports The Sun. When the comic-strip beagle and an accomplice failed to break down a staff door, they pelted prison officers' cars with concrete missiles. A prison service source said: 'It's not every day you see a giant cartoon dog going on the rampage after trying to break into a prison. The duo were arrested and it then emerged they had targeted the wrong jail - the family member they wanted to free was imprisoned elsewhere.